Today, I’m sharing a quick and easy dinner recipe that is absolutely delicious. This one pan chicken alfredo is perfect for busy weeknights, or any night when you want to have dinner on the table in about 30 minutes. Serve this alongside a simple salad for a meal the whole family will love. The best part of this chicken alfredo is that it is made in just one pan, just like my Skillet Enchiladas. Easy prep, and easy clean up! Start by browning the chicken in olive oil over a medium high heat. Turn the heat down and add minced garlic. Sauté for about a minute. 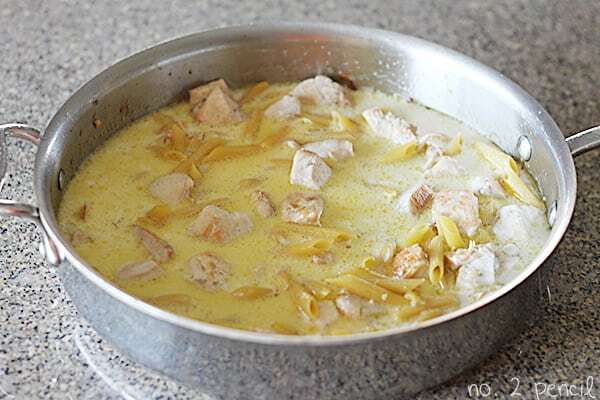 Add chicken broth, cream, and uncooked pasta to pan. Turn up heat until mixture starts to simmer, then cover pan and turn heat back to a simmer. Simmer for 15-20 minutes or until pasta is tender. Remove from heat and stir in two cups of freshly shredded parmesan cheese. Sprinkle with flat leaf parsley and serve. 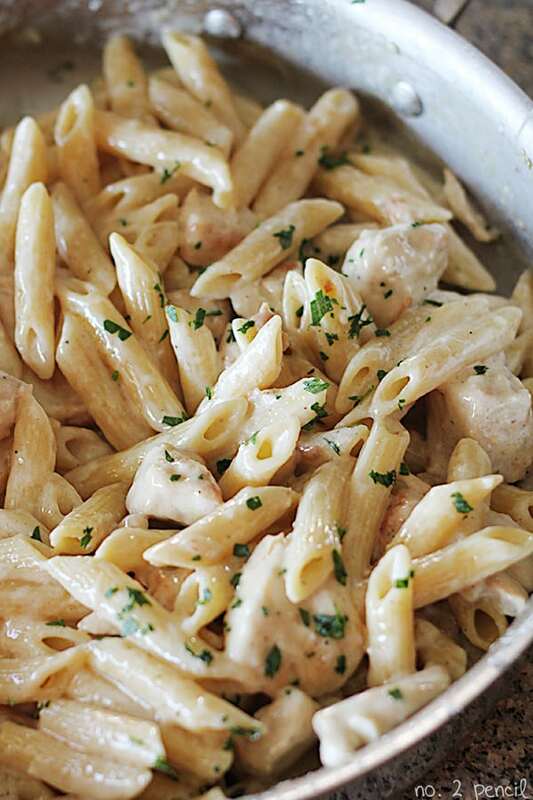 An easy, One Pan Chicken Alfredo Pasta dish. 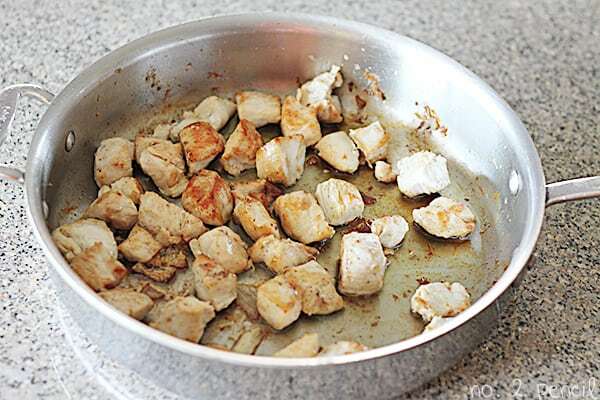 Start by cutting chicken breasts into 1 inch pieces. Season with 1/2 a teaspoon of kosher salt and a few turns of pepper. This sounds yummy!! As do all your recipes. Okay sort of a silly/dumb question, but is the pasta cooked before adding to the mix?? Or just uncooked?? Thanks so much Donna! You add the pasta to the pan uncooked/dry. Thanks for asking, I’m going to clarify that in the recipe! You know what Melissa I just re-read the recipe and I think it is clear. It says until the pasta is done!! Duh – sorry for such a silly question!!! But thanks for answering. This looks delish! I never make alfredo because it’s kind of a pain to make the sauce but I love how easy this sounds. I remember you telling me about it…did you say you had a “skinny” version too? Thank you! Yes, I have a “skinny” version I’m working on with greek yogurt. I use whole milk instead of cream and use an Italian blend instead of just parmigiana because the milk takes on a stronger flavor than cream. Not exactly skinny but it does cut the fat significantly. I also put the milk, broth, and cheese in a blender. Greek yogurt sounds like a good idea to swap out for milk. Did you ever do the skinny version? I would like to know how it turned out and what you substituted. Thanks! This looks so yummy Melissa! Pinned! This looks awesome! I try to steer clear of Alfredo for calories, but sometimes I can’t resist. Thanks for sharing! We love alfredo so I am definitely going to try your recipe! Sounds amazing and easy! I am SUCH a sucker for alfredo!! This looks amazing! Just made this and was in and out of the kitchen in no time. I would love it to be a bit more “saucy”, any suggestions? It taste fantastic, and besides adjusting seasoning at the very end, I will be making this again. The true test is when my spouse gets off late tonight, and eat this for “breakfast”…. I would try a little more cream next time! This looks so good. I love that its a one-pan meal! Thanks for this recipe. I tried it tonight after seeing it on Pinterwt and the whole family enjoyed it. We will make it again and now I’m checking out your other recipes. This was really perfect! I halved the recipe for myself and my husband. I was a bit skeptical that the pasta would be cooked through, but that 10-minute simmer time was perfect. And it was the right amount of time to shred some fresh Parmesan and clip parsley from my garden. It’s my new go-to cheat night dinner! This is a FANTASTIC recipe!!! 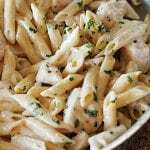 My husband loooooves chicken alfredo, and he thought this was the best recipe I’ve tried yet (and I’ve tried so so many). It’s so easy and everything is really flavorful! Plus it has so much LESS cream and butter than other recipes I’ve used. I’m never ever using another recipe for chicken alfredo but this one again! Just made this for dinner, I added two tablespoons of cream cheese and two tablespoons of butter to make it extra creamy oh and added a little more garlic powder and it was sooooo yummy! Hubby and son said better than Olive Garden! Very good, this is defiantly a keeper!! I love those additions! Thanks for sharing!!! Melissa – I cannot wait to try this! My picky four year old will love it! Can’t wait to check out more of your recipes. Thanks for that tip Ashley! I was thinking of adding a tablespoon or two of cream cheese after a comment above asked how to make it a bit saucier. Glad it worked for you! Making this now! I had to double the recipe, so I used a pot instead of a skillet. Hopefully it still works! I know, I just commented a few hours ago, but omg this was SOOOOO good! My family loved it and I’m already planning to make it again. Awesome Alyssa! Thank you so much! I just love hearing that! I made this its soooo good even my dog wanted more! I love how simple and delicious it is! You, my dear, are a GENIUS. We loved this and we don’t even eat pasta that much. Thank you for this fabulous recipe. Made this for dinner tonight and it’s definitely a keeper! Have your skillet enchiladas on the menu later this week! I would just like to ask if heavy cream is same as thickened cream? Thanks a lot! I think it depends on your area. Are you in the US? Look for what you would use to make whipped cream. Am in Australia 🙂 Will check what we use here for whipped cream. Looking forward in trying your recipe. Making this for dinner tonight! Thanks much for the recipe looks delicious!! Wow! This was DEEE-LISH!!! My husband actually licked his plate…. I was a little shocked but it sure made me feel good! I think I may have done something wrong though. After the pasta was finished, I mixed in the parmesan cheese. The parm melted and stuck to the chicken and did not blend at all with the other sauce. The sauce was so good but also so runny, it didn’t realy turn to a cream and stick to the noodles (thus my husband licking up the extra off his plate ;)). Did I heat the cream too high? I’m making this again for company but want it to be more creamy than watering. Any tips?? Or did anyone else experience this? I just made this and my sauce is runny too! I’ve checked and re-checked the recipe but I followed it. Apparently others are not having this problem so I’ve done something wrong. I’ve made this at least 5 times now! So good!! 🙂 Glad I found this recipe! Can you make this using shrimp in place of the chicken? Very easy to make and very yummy! My daughter loved it too! Gotta love Al Fredo! I make something similar that requires less attention when cooking. I preheat my oven to 450F then coat a cast iron Dutch oven (bottom, sides & lid) with olive oil and add pasta. I dilute some pesto w/ equal parts olive oil and toss to coat the pasta then add broth. Layer with parmigiano & cream (I use yochee) and some fresh or still frozen snap peas then I top with defrosted, fried, breaded, boneless chicken breast (from my pre-made freezer stash). Cover & bake for 35 min. 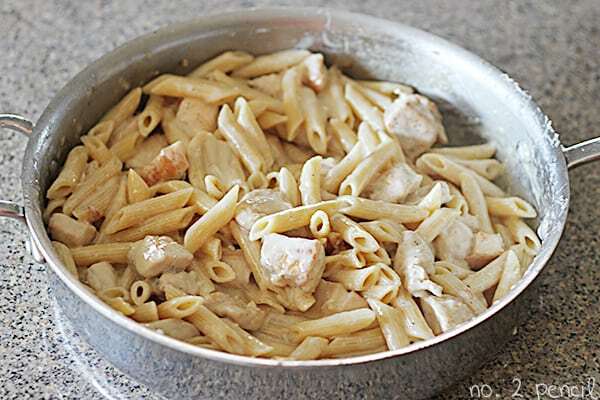 Place chicken on a serving plate & then mix the pasta w/ sauce & serve from Dutch oven. That cracks me up! Thanks for sharing! Made this tonight for the family was a hit! I added more cream and raised the pasta to about .75 lb because the box was a full lb. I used 2 cups of shredded cheese but next time might go w just 1 1/2 as that’s size of one package. Used dried parsley but was delicious. Thank you for this recipe, I found it when I pulled up at the grocery store! Another rave review! I added some spinach at the end, and did half shrimp/half chicken. Quick, easy and good!! Love these easy dishes. 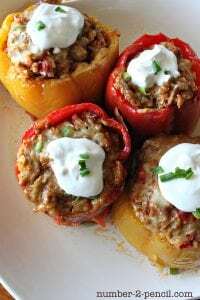 I recently made another similar one with ground beef – One Pot Goulash and the thought that comes to mind for both of these is would it not be healthier to add the pasta in cooked simply because otherwise the starch remains in the dish. Thanks so much for the recipe! I’m a college student and this was so quick and easy. Not to mention delicious!! This is absolutely delicious and so easy! I love it, thank you! This is a favorite of my son and daughter in law at Olive Garden and any restaurant when they go out……….so I took a leap of faith and tried your recipe. Not only was it a hit but they copied the recipe that night to take with them. I did add the cream cheese and butter that another person had suggested. Wanted you to know your recipe ROCKS!!! Just wondering about adding thawed broccoli. Would you have to change any of the recipe to do that. It sounds wonderful.Thank you. I never leave comments like this but I have to say, I stumbled upon this recipe via a google search for easy chicken alfredo and I was really skeptical at how this would turn out because it just seemed TOO easy ha ha. It’s delicious! I didn’t have chicken stock and had to use beef instead but even so, it still turned out great and was super easy. Will definitely make this again. I’d also be very interested if you come out with a lighter version! Thanks for the great, easy recipe! If I needed to use the whole lb of penne (lg fam 😉 would I just double the recipe? This is SO easy and quick. I used a knife, cutting board, a pan, and a measuring cup. That’s it. Less mess the better. Tasted wonderful, too! Made this tonight for hubby and it was a hit! Didn’t have cream on hand but substituted half and half with 2tbs butter. I used grated parm and it creamed right up! Not runny at all. I made this last night and had high hopes because I liked the one pan idea. But after I put in the parmesan , it stuck to the spoon and bowl. It didn’t turn out as thick as I thought it should. We still ate it , it was still good. So I feel I did something wrong ? Hi, I made this last night and besides a quick sample before it went in the fridge, we haven’t tried it yet. From what I tried and the way it looked, and how easy – this recipe is a keeper! I did have the same issue as a couple of others, with the cheese melting and sticking to the chicken and spoon. I stirred and stirred and it wouldn’t blend in, just seemed to lump all the chicken together in clumps… Maybe reheating will help. Anyway, I wonder why we’re having this happen, if others aren’t? Could it be because I used pre-shredded parm (in the bag), and maybe these pieces are bigger than what you would get if you shred it yourself? Any thoughts/tips to get the cheese to blend into the sauce better would be so appreciated. Thanks for an awesome recipe! Yes, the bagged cheese does not melt as smoothly as freshly shredded. If you want to use the pre shredded cheese, I would try using less and see if that works. Happy cooking! I like this, but how can I make this more cheesy? Thanks! I know that feeling! I think the half and half will work, it will probably be a bit runny though. Let me know how it goes! I tried this recipe about a month ago, it was delicious! I changed a few things. I replaced the cream with 1.5 cups evaporated milk and also added 4oz cream cheese with Greek yogurt. It was very creamy. I also added 1 package chopped frozen spinach, thawed and drained. Making this again tonight! Thanks for the recipe! Thank you for this recipe! I am really stressed with trying to complete three research papers before the end of November. I needed something to cook really quick for my family and this was perfect. I seasoned the chicken with Chef Emeril’s essence and served with steamed broccoli and carrots. I will be making this again and again. I made this for dinner last night – I doubled the recipe because so I had to use a pot rather than a pan. Because of the pot I was using and the fact that I had double the amount of liquid as the recipe calls for, it took foreverrrr to come to a boil and by that point, I only had to simmer it for a few minutes. At the suggestion of some other commenters I also added a bit of cream cheese to thicken it up, and while it tasted great, I think it would have been just fine without it, too. So far, this is my favorite found-on-Pinterest recipe that I’ve tried and I’m thinking it’s gonna have to become a staple. SO good. This recipe was so good and so easy!!! I’ve attempted several other fettuccine recipes and failed miserably but this one was so good. A couple alterations I made, because I didn’t have all the ingredients… Instead of heavy cream I used skim milk and then added floor to about 1/4 of the chicken broth, before adding it to the pan, to thicken it up. Also, I ended up not having enough parmesan cheese so I added some mozzarella. Just wanted to say thanks for the recipe. Used it tonight and increased the recipe by 4 (2lbs of pasta and 4lbs of chicken breast) in a big pot as family of 4 loves leftovers and pasta… Also, used light cream instead of heavy (only because the heavy/whipping cream is so expensive where I am) and it came out delicious!!! Great easy recipe and thanks so much for sharing! I haven’t tried that, but please let us know if you do. Thanks! Made this tonight, followed the recipe and it came out absolutely amazing!!! So easy! Thank you! This recipe looks delicious, looking forward to making it, but would this be enough for a family of 5? Can you use the whole box of pasta? I made this tonight for dinner and it was delicious! I deglazed the pan with a little white wine before I added the chicken stock and cream. I can’t wait to try more of your recipes! Awesome recipe! Made this tonight and it was a hit! The family was very happy and I was happy with how easy it was to make on the fly! Adding this meal to our monthly menu per request of the fam. Thanks for sharing! This was so tasty, and seemed like the flavor got better as we had it for leftovers for a couple days. I was wondering if you’ve ever made this as a frozen meal to heat later? If it would still be good that way? I don’t think it would work as a freezer meal. Cream and cheese do not freeze well. I’m so glad you liked the recipe! I loved this recipe. I would like to try it as a primavera next time. I especially liked the easy clean up! Just had to come back and say how wonderful this is! The whole family loved it and my hubby said I must make it again. My picky 4yr old even ate it up! Thank you for sharing! I made this a few nights ago and it was delish! I will definitely make again. Ive just finished eating this with my husband, it was amazing. I changed a couple of things. I cooked the chicken in 1.5 tbl spoons of green pesto and very lazy chopped garlic and added some torn ham.I also cooked my pasta separate and added towards the end.yum.yum. I made this for my best friend’s birthday dinner. The taste was delicious! Next time I would just double to sauce part to make it more saucy. I will definitely make this again! The whole family loved this recipe. I added some creme cheese and butter to is along with some veggies (bell pepper, Mushrooms, Onions and broccoli ). I am making this for a 2nd time tonight. Great recipe! Stumbled upon your recipe yesterday and made it for dinner with a few adaptions for my families diet…used half of the pasta called for and included thawed cauliflower and thawed peas. We all loved the sauce! Super fantastic! Thank you for sharing your recipe! I made this dish a couple weeks ago and it was seriously my favorite pasta recipe I have ever made. I did change it up a little though I added bacon, red peppers, and onion to it also and more liquid so it’s not dry. My whole family looooved it and kept asking me to make it again the next couple days. It is the perfect pasta dish. I am making it for dinner tonight too and I am adding corn to it this time since my kids love corn!! Thank you for the awesome recipe!!! Made this tonight. It was easy and very tasty. 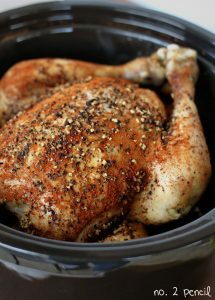 We experienced the problem a couple other people had… the Parmesan ( we grated it from a big block) stuck to the chicken. What is a good work-around to prevent the cheese from sticking to the chicken and to make the sauce a little thicker rather than runny? Add a bit of all purpose flour or cornstarch maybe? Thanks! I haven’t had that problem, but one thing that comes to mind is that your cream mixture might be too hot when adding the cheese. Try simmering covered on low and removing from heat when stirring in the cheese. If the cheese is seizing up instead of melting, your sauce would be very runny. Good luck! I decided to make Chicken Alfredo for my church and came across this recipe. I took a risk trying a new recipe and makin it for the first for others to eat. Just in case I purchased extra chicken and noodles if it came out bad. This is AWESOME!! Everybody loved it. In fact, the extra items I purchased I went for the second batch I had to make. One pot and it really easy, I will be making again. Made this for dinner tonight – delicious! I doubled everything to make the whole box of padta, but only mixed in 1 1/4 cups of cheese (1 bag). It thickened up the sauce perfectly! I mixed a bit more cheese in my bowll. I also added broccoli. Super easy! Going give this a try tonight….don’t want to go to town for chicken…I got some frozen Tyson grilled chicken strips….will that work? I’ve never used the frozen chicken strips, but I don’t see why you couldn’t. Let us know how it turns out! Melissa, what is heavy cream?? It’s available in the dairy aisle. You should be able to find it by the half and half. It is also used to make whipped cream. I made this last night, but modified it to use fettucini instead. It is fantastic, and so easy to make. Thanks for the recipe! It melts in to create an alfredo sauce. I made this last week and it was so good! I did shrimp instead of chicken and ended up throwing in some sundried tomatoes at the end, which thinned out the sauce a bit but it was one of the best things ive ever made. my boyfriend doesnt love sauces that are too thick so it worked out perfectly. I will absolutely be making this again soon. Melissa, just spotted this on Pinterest. I do love a good one-pan pasta dish AND an alfredo that does not include a jar of store-bought sauce! I cook all the time and never leave a comment, I just had to for this one. I’ve tried a lot of different Alfredo recipes, as my boyfriend is training for his iron man and needs the fuel…this is the best one yet. I love how easy it is and it’s definitely a bonus that there is only one pan to wash : ) Thanks! I get a lot of recipes online, but this is the first time I found it worth the effort to leave a review. I LOVED this recipe. I’ve tried a lot of different Alfredo recipes throughout the years, as my boyfriend is training for an iron man so he needs the fuel before his big training days…this one is by far the best and easiest. It’s also a bonus that there is only one pan to clean. Thanks so much! I made this last night and it was delicious! The leftovers today were great too, and didn’t have that same oily effect that you get with regular alfredo sauce. I used cajun seasoning on my chicken in addition to the salt and pepper, and the flavoring was perfect. I also added a couple of tablespoons of butter to the sauce, just before stirring the cheese in to everything. I didn’t have the issue with the cheese like others have posted. I did use half-and-half (because I didn’t have cream in the fridge and this was not planned ahead), but it seemed to curdle when I added it to the pan. Maybe I need to warm it up first? I think that the next time I make this I will add chili pepper to the spices, and asparagus as well. Also, I will simmer for only 12 minutes max so the pasta will be more al dente. The best part about this…only one pan to clean at the end! Thank you so much! I need the recipe to feed at least 6 so how much more of each ingredient should I use?…thank u for any help! I think you will find doubling the ingredients to be the easiest! This looks really yummy! Do you have the calories and fat content of this recipe? I want to make this but I would like to know the nutritional facts of this. Okay I have a quick question. What if you already precook the pasta what would be the appropriate time to add the pasta? The sauce would be very thin, the liquid ratios in this recipe are meant to be used with uncooked pasta. I hope that helps! We tried this tonight and it was pretty good. I made three changes and plan on changing it a tad more next time. I added some cajun shake while cooking the chicken because it seemed like it would be bland (totally a good call), I also only used 1 cup parm because I didn’t realize that’s all we had (still great), and lastly I added one crown of broccoli steamed and it was great. Next time I think I’ll cut the olive oil and maybe add some asparagus. But this recipe lends itself to changes. Very good. I made this using a rice cooker and it was perfect. Tastes pretty good. I like that it is already a lighter version of Alfredo. I actually used 2% milk. My problem was I didn’t have any fresh Parmesan, which I thought I did, so I substituted a good grated Parmesan, but I didn’t get the consistency I was probably supposed to get. Next time I’ll make sure I have the fresh cheese. It was super easy which I love since I have little ones! This was so delicious! I am so glad I stumbled upon your recipes on Pinterest! I have been making the Pioneer Woman’s recipe for chicken alfredo for a few years but I could never get the sauce to really thicken. But we loved the taste and would rather have the runny sauce than junk out of a jar. I made a few changes to your recipe. I Cooked the chicken in butter just for richness/flavor preference and I add italian seasoning and smoked paprika on the chicken as it cooks. I also added broccoli when I added the noodles and a little extra cream (Shh! Our secret okay?). I buy fresh grated parmesean and it melted perfectly into the sauce. I love this recipe and I love you for making it! Omg, words can’t describe how good this is! 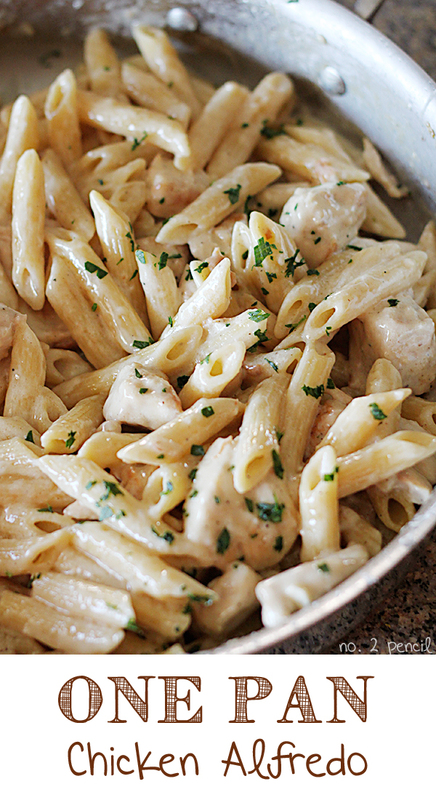 This beats any Alfredo recipe I’ve tried and its super easy to make! I wasn’t sure how much 1 and 1/4 of a pound of chicken was (I buy in bulk lol), so I just filled 1 and a half or 2 cups of chicken breast strips to the pan and it was the perfect amount. This recipe taste just like restaurants! Already made a second time, I’m loving it. Only negative I can think of, isn’t necessarily associated with this recipe but all Alfredo recipes, is reheating. I’m trying to figure out a way to reheat without the whole thing swimming in oil. Also, the first time I made it, the sauce came out perfect. It wasn’t too runny or too thick. The second time I made it, there was like no sauce. The only variation I can think of is the part where you let it simmer with the lid on. At least with my experience in making this, I think the mistake was leaving it on too long to simmer and all the sauce evaporated more quickly. I figured I’d mention that in case it might help someone else. Because after it looked thicker, and then when I added the cheese it looked like mac n cheese basically. I still of course love it because the flavor and everything is there so it didn’t bother me any and it was from me multi-tasking and not watching it more haha but I definitely love this recipe! It’s my go-to quick meal. Thank you for sharing, Melissa! I love your one pot meals. They work great for my job. I have to cook for 5 handicap clients every dinner. Picky eaters. The only thing I would ask, is it possible for you to add nutritional information to your recipes? I have to figure out carb counts and calories for every meal. That you very much! Thanks for the comment, Tina! That is something I’d love to add, hopefully in the future! I’ve been making this for a few months now, family really enjoys it & I make very few adjustments. The first time it came out perfectly- BUT, the past 3 or 4 times I’ve made it, when I add the cheese at the end, it all seems to melt, but instead of blending in with the sauce, it seems to gravitate to the chicken & I end up with big cheesy clumps of chicken…. Have you ever had this happen or have any idea what I might be doing differently that would cause this to happen? It still tastes good, just not quite as good & obviously annoying to have to pull the chicken pieces apart since they stick together. Thanks! Make sure you are using heavy cream, which is very thick. It has a higher fat content and the cheese melts readily into it. Different brands can vary. I have found if I use the cream from costco it is not thick enough. You may also want to make sure the mixture is not too hot when adding the cheese. It should not be boiling, as this will cause the cheese to separate. Are you making any substitutions to the recipe? Hi. I made this for the first time Saturday. It was delicious and our 5 year old son ATE IT UP!! That said, I did have the same problem as Jynell with the chicken and cheese clumping together. I used Sargento shredded parmesan that comes in a bowl. Do you use fresh-grated? I wonder if the Kraft powder would work? I also thought about cooking my chicken completely and adding it back in at the end, once the cheese is stirred in. I’ll try that and let you know how it goes. Freshly grated parm is the way to go! Preshredded cheese has added ingredients that keep it from clumping together in the bag or container and also keeps it from melting very well. I used a microplane to finely shred parmesan off a block and it works perfectly! I’m a stay at home dad and im always looking for great tasting and easy recipes. This one definitely fits the bill! FYI, I put some microwave steam broccoli in it at the end. Game changer! My six year old loves it too. For those of you that want a skinny version… just use fat free half and half! I have found I can use that instead of any cream in almost all recipes and they still taste great! I will try it when I make this one. This is amazing! My family loves this recipe. I cant even tell you how great is is! But i will say if you prefer a saucier Alfredo ad a little bit more of both liquids. Made this tonight, came out great! Used a little more cream to thicken up the sauce and added broccoli. Thanks for the recipe! I can’t wait to try this. I’m a struggling grad school student who can’t seem to find the time to cook/eat anymore. I got so excited when I saw “one pan”. This sounds so easy too! Would you happen to know how this would work as a freezer meal, if it’s possible at all? I would try my one pan chicken and broccoli for a freezer meal. Alfredo isn’t great to freeze because it separates when reheated. Hope that helps! I hate the taste of parmesan cheese. How crucial is this for the recipe? That is what thickens it. It definitely adds to the flavor and may be a bit bland without i, but you could always thicken with a bit of cornstarch and water and add some garlic and other herbs for more flavor. These was really good and SO simple. Used tri-color rotini and added fresh mushrooms and diced green onions, and used leftover chicken. Thanks for posting! How large is your group? You can easily double or even triple the recipe. Just make sure to brown the chicken in batches so it doesn’t crowd the pan! This is my family’s favorite. I am a horrible cook, but this recipe is fail safe! When everything is done in the pan, I transfer it to a big casserole dish and sprinkle more parmesan on it, then put it in the broiler for a minute or two. SO GOOD! Made this for my wife tonight and she absolutely loved it. Great, easy and cheap recipe. This will be added to the monthly rotation. I made this tonight, it was SO good and so easy! My family loved it! I added some cooked broccoli too! I made this a couple of nights ago for dinner. I didn’t have heavy cream, I used 1/2 half and half and half 2% milk. This was so simple and so delicious. Thanks for this one pot recipe. I never comment on these things, but I just wanted to thank you for this recipe! It’s so easy and tastes better than every restaurant I’ve been to. I love being able to cook it all in one pan. It’s a regular on our dinner menu. Thank you for taking the time to comment, Kelly! I’m so glad you enjoyed it. It’s one of our favorite recipes too! This was very good! In an effort to make it healthier, I used evaporated milk instead of cream. Because I used milk, I added a few tablespoons of neufchatel cheese to make it thicker, and I didn’t find the sauce too runny – the parmesan helped! You have to use the fresh stuff. I also doubled the recipe for everything except the olive oil (and the cheese – just grated a handful then got lazy) – my pan was a little crowded so the chicken and garlic didn’t exactly brown, but not a big deal. And we have a fair bit of leftovers, will be good for later this week! This was a quick and easy meal! I added some broccoli before I added the liquid. I will definitely be adding this to my weeknight rotation. I just made this and oh my god, it was so easy and it tasted SO GOOD! I halved the recipe and the result was amazing, I will definitely be making this again in the near future. Thanks! Super good, maybe gradually add in cheese, as two cups was super cheesy when I made it!